Crimson AV sells professional Audio / Visual mounting equipment for home and industrial displays, including projectors, flat panel, and multi-monitor systems. And for something totally different, Crimson also offers mini folding pocket-size stands, the Pocket-eAzl tablet stand and Photo-eAzl camera tripod. What makes these different is that they come from the same heritage -- solid and rugged metal. These are made from aluminum-zinc alloy with hardened epoxy finish, with rubberized slip-free contact points for the legs and to support an inserted tablet. And yet they cleverly fold up to compact down to around 3 3/4 x 1 1/2 inches. 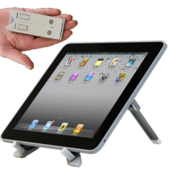 The Pocket-eAzl is a folding stand for tablets and e-readers, in landscape or portrait orientation. It unfolds in three pieces from the center frame. One side has two legs that fold over and spread out to provide a firm base, and the other side unfolds as the back support. The legs have ruggedized flip-out support for the base of the tablet. The back piece provides dual-height positioning -- use it as is for a lower setup for typing, or the interior folds out to extent the support for a higher viewing angle. The fully expanded base extends 8 inches from front to back, and is 5 inches high. The Photo-eAzl expands the design to serve as a compact camera stand / tripod with adjustable shooting angles. It adds another fold-out plate with a universal 1/4-20 mount head adapter, with a hinged footer that can be adjusted in notches on the center frame to provide multiple tilt angles. You then can use the Photo-eAzl to hold cameras, camcorders, and pico projectors, up to 15 lbs. And, of course, you can still use it as a tablet stand. The Pocket and Photo eAzl are smart and solid devices that fold down cleverly to impressively small sizes. The metal construction makes them rugged, though at some cost in weight -- the Pocket-eAzl is around 0.44 pounds. But your tablets or cameras certainly will be comfortably secure. The Crimson AV Pocket-eAzl folding stand is available for around $25, and the Photo-eAzl is around $69. So, what the heck is the PSiO Audio Visual Stimulation System? Well, you could describe it as a visor that flashes bright colored lights while you listen to music or motivational talks. Or you could be more formal, and say that it's a kind of Audio-Visual Entrainment (AVE) system (see Wikipedia) that uses flashes of lights and pulses of tones to guide the brain into various states of brainwave activity. Or PSiO describes the product as a pair of glasses with plug-in earbuds that displays colored and rhythmic light with synced audio -- for relaxation, simulation, recharging, and personal development. The idea behind the flashing lights is to "over-stimulate" the mind -- to help stop the brain when it's caught in racing distracting thoughts, and let the mind relax. The relaxation then can have an energizing effect. Or, the relaxation can leave the mind open to suggestion, so PSiO also offers music tracks with personal development voice-overs. Different tracks are designed to encourages specific brain wave patterns targeted to different goals, including energy (alpha waves), memory (theta), and sleep (beta to alpha to delta). 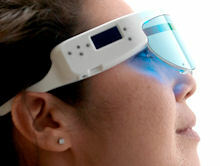 The glasses are controlled using a small mono display and buttons on one earpiece. You can skip through programs, and adjust the volume and brightness level. And you will want to experiment -- The PSiO includes a tutorial track that explains the controls and has a couple samples of the music and voice-over sessions. But the first time you experience the bright flashing lights right in front of your eyes is rather disconcerting. PSiO recommends turning down the brightness level at first, and closing your eyes (as will naturally happen with relaxation programs). The PSiO is available for $399, so you can experience pulsed stimulation for yourself, to sync your brainwaves and direct your mind. Bell'O International designs and manufactures premium A/V furniture and consumer electronic accessories, including flat-panel TV towers and wall mounts, speaker stands, and home theater chairs. And for your portable media, Bell'O offers a nice collection of earphones, combining sound quality, with lightweight comfort and durability. For sound, the earphones are designed with neodymium speaker magnets for clear and bright sound and precision bass. They also boast 99% oxygen free copper wire and a 24K gold-plated plug. For comfort, they include three sizes of soft, durable silicone ear buds and in a lightweight design using low mass polymer or metal construction. And for durability, they use a 4 foot flat cable, fabric reinforced with strain relief, for flexibility and to reduce tangles. - The universal BDH653 earphones are designed for most Apple, Android, and BlackBerry devices. It includes an integrated microphone, in-line sliding volume control, and universal one-touch track control. These are priced at around $39, in styles with black chrome and copper, piano white and black chrome, or dark chrome and matte black. 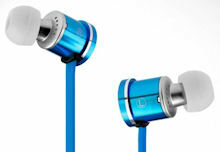 - The BDH654 earphones with Apple remote are designed for the iPhone, iPod, and iPad. It includes the three-button remote control with microphone, for volume, Siri / voice control, play/pause/skip, and answer/end/switch call. These are priced at $49, in styles with black chrome and copper, or piano white and black chrome. 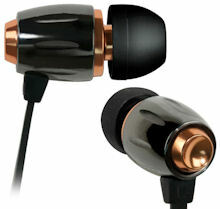 As you can see from the image, these Bell'O earphones deliver on the promise of solid sound in simple, clean, attractive designs (this is the black chrome barrel with copper ends). Lots of companies are getting into consumer headphones and earphones, expanding from backgrounds across areas including traditional consumer electronics, phones, sports, PC peripherals, and high-end A/V equipment (see previous post). Another entry point for consumer audio is from premium sound systems, as with the Velodyne vPulse In-Ear Headphones, developed by a company has been known as an industry leader in subwoofer performance for almost three decades. Not surprisingly, Velodyne focuses on sound quality in the vPulse earphones, with a 10 mm driver and aluminum housing for low-distortion audio and tight bass. They also are designed for a comfortable fit, with a secure in-ear design, and a pressure-relief system to reduce air pressure in the ear. The construction design is particularly rugged, with a thicker flat tangle-resistant cable with a 3-button (Apple) in-line control. The Velodyne vPulse Earphones are available for around $99, in more subtle classic black plus punchier velodyne electric blue or hot pink. The design does seem more durable for use on the go, as on crowded trains, with the more substantial cord and larger controls that are easier to use by touch. Entries posted to Manifest Tech Blog in August 2013, listed from oldest to newest.